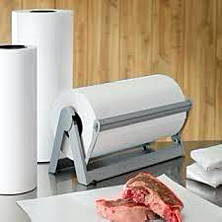 Butcher paper is a heavy-duty kraft-style paper that has traditionally been used by butchers to wrap fresh meat. While the most common style that comes to mind is a roll of bright white butcher paper, it’s also available in pink (also known as peach paper or natural butcher paper). It comes in various size rolls as well as convenient, pre-cut sheets. Both kraft paper and butcher begin with the same exact raw materials, meaning kraft paper actually shares the same wood fiber as butcher paper. The true differences between these papers comes down to how they are processed beyond their raw materials and how they are best used. What makes butcher paper different from kraft paper involves the manufacturing process, which gives it holdout and makes it certified for food grade use. 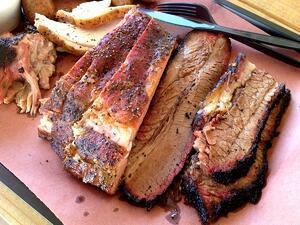 Butcher paper is engineered to withstand blood and moisture better than standard Kraft paper. Butcher paper is also different from freezer paper. Freezer paper also starts out like butcher paper, but before it’s cut to size and packed for shipping or sale, it receives a polyethylene coating on one side. This coating provides freezer paper with the valuable moisture seal and vapor barrier that makes it perfectly suited for protecting fresh meat and seafood from freezer burn for months. Additionally, true butcher paper — the kind any food service establishment should be using — is 100% FDA-approved for safe contact with food. Obviously, at the local butcher’s shop, butcher paper is going to be used as it always has been: to wrap and protect fresh meat and seafood that’s been cut for customers to bring home. 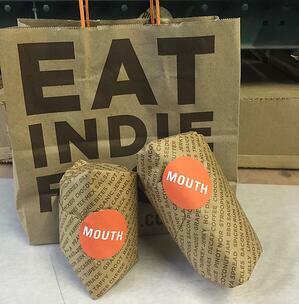 In this case, 100% FDA-approved butcher paper provides a clean, practical and economical alternative to other potential vehicles like styrofoam trays or plastic bags, allowing customers to bring home their food without worrying about juices leaking out and making a mess. It also offers a solution to environmental concerns, as a conscientious choice for customers who want to avoid unsustainable food packaging. At the same time, it offers both the butcher shop and their customers the convenience of a surface to label the wrapped meat so it can be easily identified from any other packages in the same cart, refrigerator, or freezer. In addition to fresh cuts of raw meat and seafood, many butcher’s shops have diversified to make available prepared foods, complementary ingredients, and even full meals. Butcher paper rolls make an excellent all-around wrapping option for sandwiches and other diverse menu items of various sizes that need to be transported without a mess. Butcher paper sheets also come in very handy for popular products that are fairly uniform in size, like standard cuts of beef or pork, or sandwiches. For butcher shops that have turned the corner to providing in-shop dining, butcher paper sheets make excellent tray liners as well. As already noted, butcher paper has proven itself an excellent resource for food service uses beyond just wrapping fresh cuts of meat or seafood for transport. Delis and restaurants dive further into these common uses for butcher paper than the more traditional butcher shops tend to, and with great success. For example, butcher paper tray liners, basket liners, and table coverings have offered many delis and restaurants clean, crisp, and functional utility at a much lower cost than traditional plates and tablecloths. Especially in the world of professional BBQ, pink butcher paper has proven a real standout as the tray liner or french fry cone of choice across the nation. One of the most powerful options available for restaurants and delis is the ease with which butcher paper can be customized via flexographic printing, adding the restaurant’s logo, contact information, coupons, or other marketing messages to all the various ways they’re already using rolls or sheets of butcher paper. Tear-off menus are an excellent example of how a roll of butcher paper can become a powerful marketing piece and a practical tool, all wrapped into one. It’s amazing to discover how just one roll of butcher paper can impact the average restaurant. From a practical and economical impact, to improved cleanliness and even marketing, the humble roll of butcher paper can do great things for any food service location. Likewise, butcher paper sheets make a powerful addition to any deli or restaurant’s toolbox. 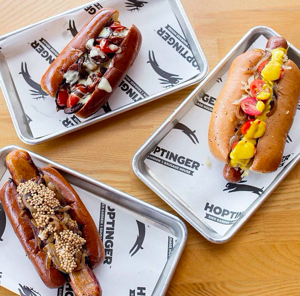 The world of professional BBQ — not to mention competitions and the humble backyard enthusiast alike — deserves its own mention among food services that have latched onto butcher paper in recent years. In this case, it’s particularly pink butcher paper that steals the show. 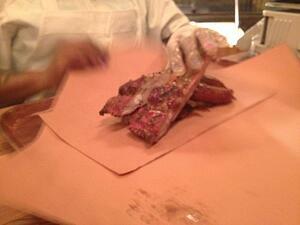 Professionals and amateurs alike love to use pink butcher paper to wrap meat while it cooks or smokes. While this fantastic method of producing mouth-watering barbecue was initially popularized by famous Austin, Texas pitmaster Aaron Franklin on his numerous online broadcasts and discussions, it’s actually been used for years by pitmasters across the country. A properly wrapped beef brisket, for instance, can be cooked low and slow to the perfect interior consistency while maintaining a gorgeous “bark” on the outside that renders sauce completely unnecessary. While large commercial operations like Franklin’s Barbecue in Austin generally rely on 1,000 foot rolls of pink butcher paper to satisfy their demand, smaller 150-foot pink butcher paper rolls are perfect for the at-home chef wanting the same authentic barbecue experience. In addition, conveniently sized and separated pink butcher paper sheets have become extremely popular for the average backyard pitmaster who may only do a handful of briskets a year. Finally, moving away from the strictly food-related uses of butcher paper, many people (as well as school art programs) have found this versatile paper product to be an excellent resource for arts and crafts projects, decorating, and other creative uses around the home. For example, many creative parents have invested in a roll of butcher paper as a simple, economical source of seemingly endless drawing and painting paper for young children to doodle on at home or in the classroom. Because it can be unrolled across a large area, it makes a wonderful diversion for groups of children to play and interact together, such as at a daycare or during a party. Others have used butcher paper as a backdrop for photos, as table coverings, or to wrap presents in a muted and sophisticated way. 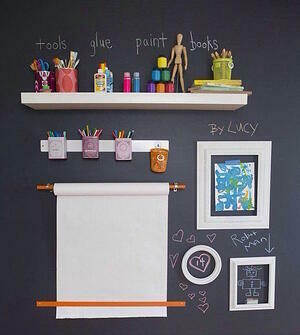 Truly, there seems to be no end to the creative and fun ways butcher paper can be used inside and outside the home. As mentioned above, butcher paper and custom flexographic printing make an incredibly powerful marketing combination that many different businesses can benefit from exploring. Likewise, any business that ships products to customers could benefit from custom-printed butcher paper being used to wrap packages for shipping or to protect items inside packages. These are great options for a number of reasons. For one thing, custom printing on inexpensive butcher paper is an economical way to enhance small marketing budgets. Since most restaurants and other food service locations work on fairly thin margins, it makes good business sense to double the utility of the paper products you’re already using. In addition, because custom printed butcher paper is so affordable in relation to other types of printed marketing materials, it can be ordered more often and with more timely messaging. For instance, grabbing a smaller supply of holiday-themed butcher paper isn’t cost-prohibitive like other possible options may be. As always, if the paper is going to come into direct contact with food, it’s vital that it be safe as proven by its 100% FDA approval. The flexo printing process does not compromise that certification or render printed butcher paper inappropriate for any sort of food service use. Really, when you look at it closely, custom printed butcher paper could be the most underrated, overlooked marketing investment any food service or packaging and shipping business can make! If you’re looking to explore all the possible ways butcher paper can make your business processes easier, faster, and more effective, our paper converting experts are here to answer all your questions. Contact Oren International today! With over 20 years’ experience as a leading international paper converting company, our experienced team knows the intricate details of paper’s possibilities. We work with distributors, companies, and individuals around the globe to meet nearly any customized paper need. From branded paper for lining restaurant tables and trays to butcher paper sheets used to wrap brisket, we’re always up for the challenge of finding just the right fit for you.